In Shanghai, or mostly anywhere in China for that matter, you can get any pet you want. I can count on my fingers all the pets I’ve owned: rabbits, goldfish, turtles, hamsters, puppies, lovebirds, parrots, owls (yes, owls), chipmunks, and kittens. Even though I’m a sincere animal-lover, I don’t have the best track record with pets. For some reason, save for a pair of lovebirds, they all die out on me. Before you report me to the SPCA, hear me out. The bunnies were cute and snuggly for a few weeks before they mysteriously got food poisoning, then the goldfish contracted some strange disease and started eating each other, which we figured out when there was a pile of bones in the corner of the tank (to this day, I hate goldfish because of that image forever burned in my mind). The puppy my parents bought me was adorrrable, but we had it for a mere 4 days (four days!!) before it also caught a stomach bug of some sort (do you see a pattern here?). I’ll spare you the details of tragic deaths of the other pets I’d had, but believe me when I say I seriously do love animals. The moral of my sad pet stories is…I don’t have very good luck with animals or any living thing for that matter. Nonetheless, I was still compelled to pick up a basil plant two weeks ago. I'd swoon over a bushel of basil than a bouquet of roses any day (seriously, am I going to toss a handful of rose petals into my tomato sauce? I don’t think so). I’m proud to say I kept the basil alive for a record-breaking seven days, so when I got a whiff of rosemary at the grocery store I couldn’t help but take it home, because isn’t there that saying? Two herbs are better than one. Thankfully, both plants are still alive, actually, not just alive, they’re thriving. They sit beautifully on the kitchen counter and motivate me to cook real food instead of reaching into the freezer at dinner for kimchi dumplings. So this cake, this beauty is the perfect welcome to spring. 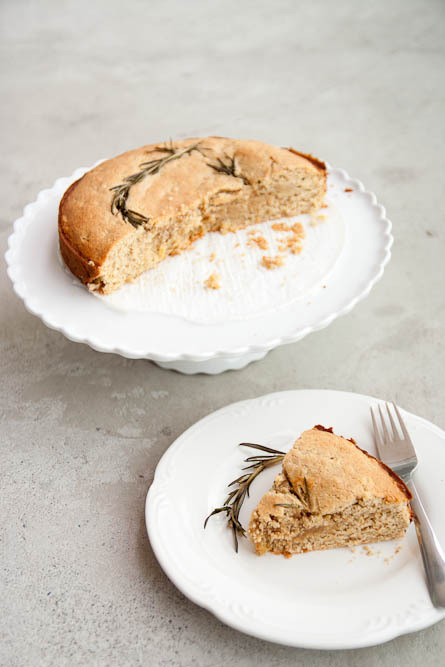 From the gorgeous Nigella Lawson, comes a rosemary remembrance cake in honor of her grandma, which I think is appropriate since I made this cake in memory of all the pets I had. This golden cake isn’t quite what I expected. 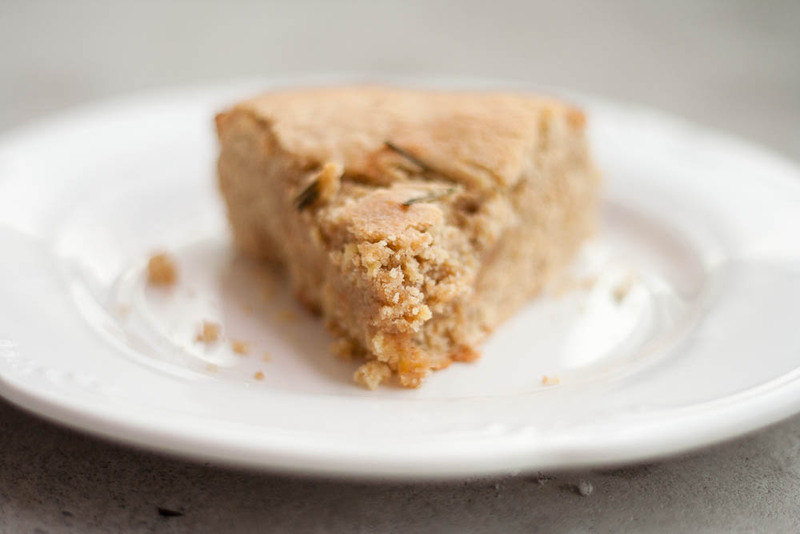 I swapped out the all-purpose flour for oat and whole wheat pastry flour which gave it a delicate texture, practically crumbling at the slight pressure of my fork. 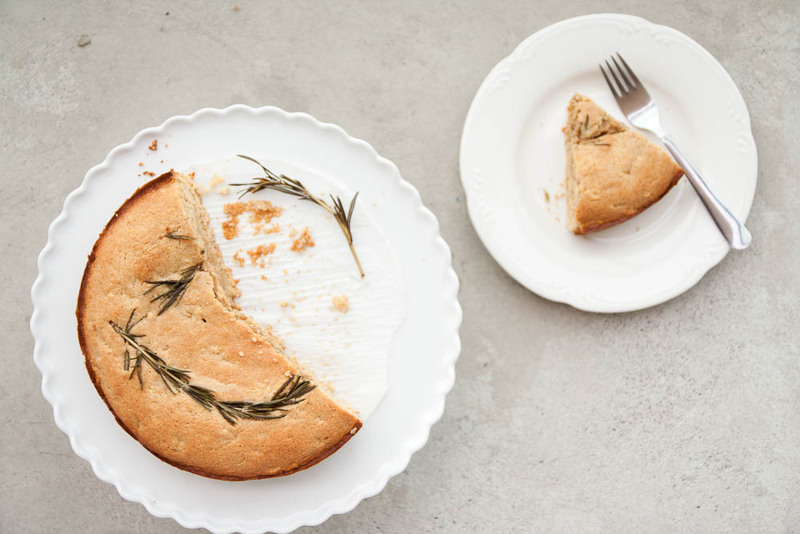 There is a touch of fruitiness from the cooked apple and an undeniable scent of rosemary, the herb is there just enough to not be overpowering, but rather lingers in the cake’s aura. The cake is nearly gone, but my herb plants are definitely here to stay. Besides, it’s probably better to practice how to make plants last before graduating on to being a pet owner. Nigella recipe instructs you to chop up the cooked apples in the food processor and add in the wet ingredients followed by the flour to create the cake batter. I went ahead creamed the butter and sugar first, added the eggs, added the chopped apples and finally mixed in the dry ingredients. I'm used to this method and frankly, my mini food processor wouldn't fit all that batter. The recipe I’ve included here is the method I used, but if you want to stick to the original recipe, go ahead click on the link above. Also, I substituted all-purpose flour for whole grain flours, but you can stick to the original recipe and use all-purpose flour if you would like. Nigella recommends using an "eating apple" in the cake, I used royal gala since that's what I had on hand, but feel free to use your favourite apple, keeping in mind the varieties of apples have different cooking times. A granny smith apple for example may take longer to soften than golden delicious. 1. 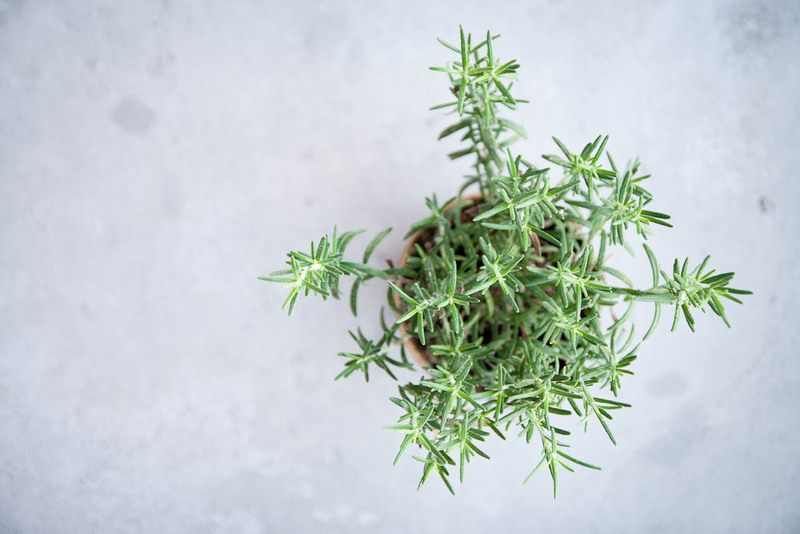 Peel, core and roughly chop the apple and put into a saucepan with the small sprig of rosemary, the teaspoon of sugar, the lemon zest and juice, and butter. Cover the pan and cook on a low heat for 4-8 minutes until the apple is soft. How long this takes really depends on the variety of apple you're using. Leave to cool, and fish out the rosemary sprig when it is cold. 2. Preheat the oven to 375F. Line a 9-inch springform pan or standard loaf pan with parchment paper. Put the cooled apple into a food processor and blitz to a pulp. 3. In a medium bowl, whisk the flours and baking powder until combined. 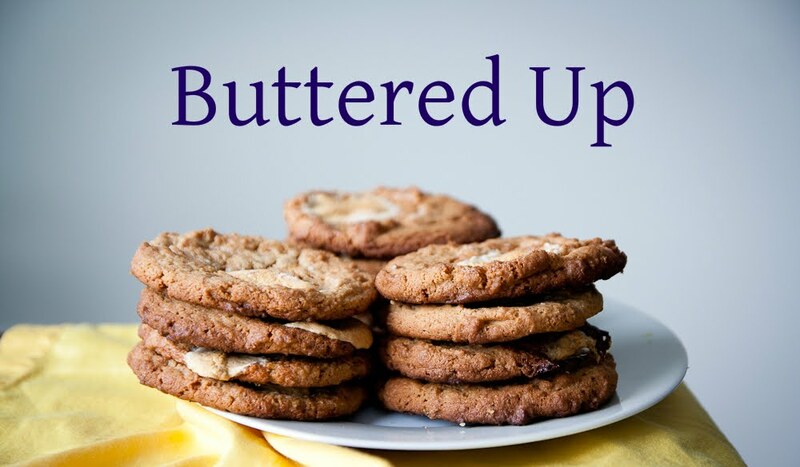 In a large bowl, cream the butter and sugar until light and fluffy. Add the eggs and whisk until well combined. Add the flour mixture to the batter until well combined. 4. Spoon and scrape the batter into the loaf tin and smooth the top. 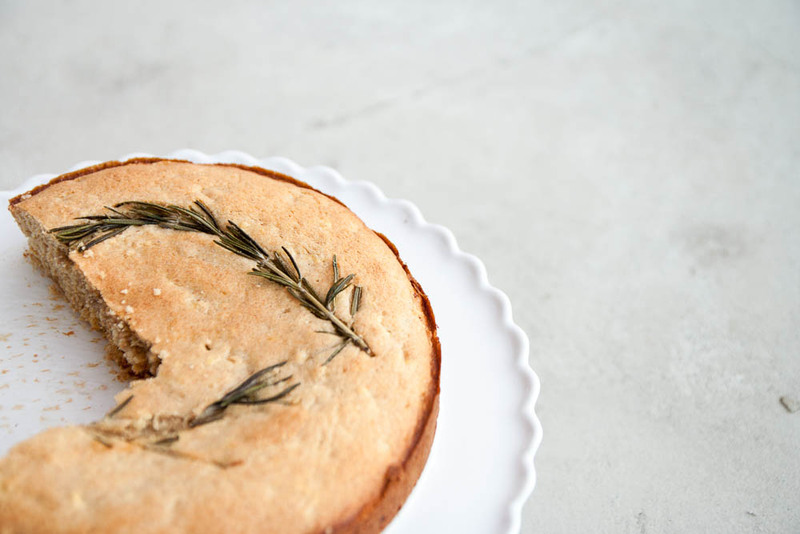 If using a round loaf pan, lay two sprigs of rosemary on top of the cake to create circle. 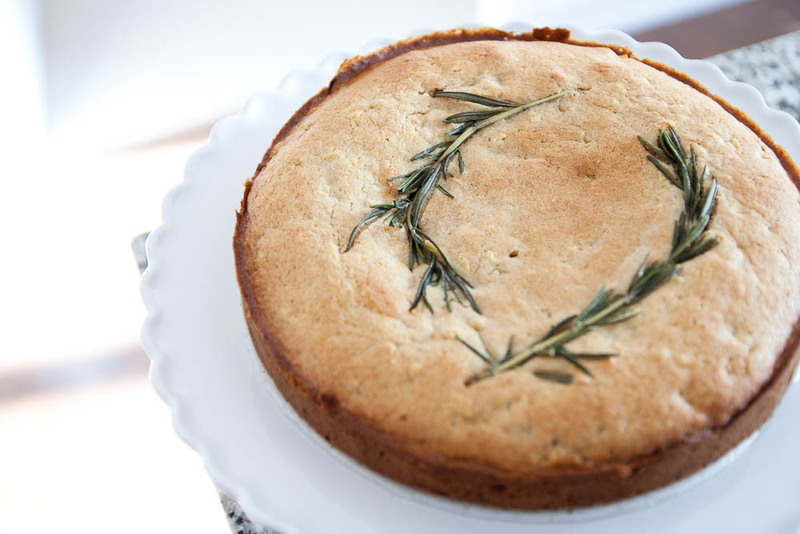 If using a loaf pan, lay the rosemary along the centre of the cake. 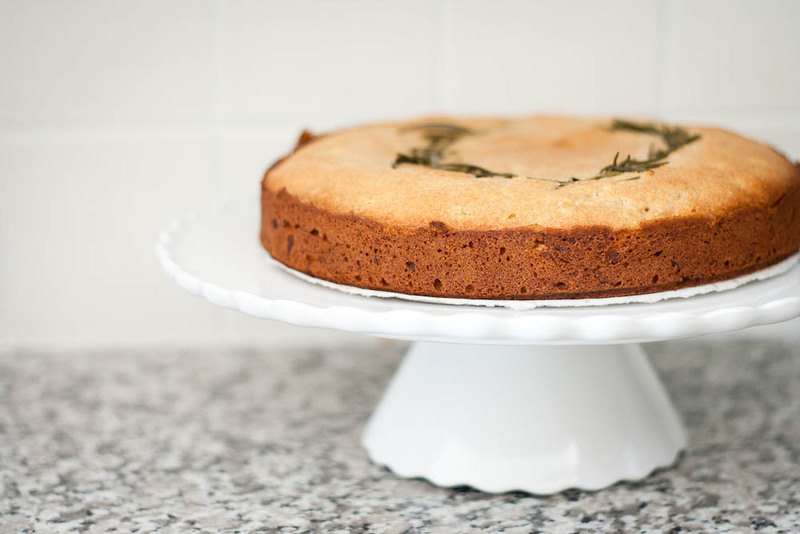 On baking, the rosemary sheds its oil to leave a scented path down the middle of the cake. 5. 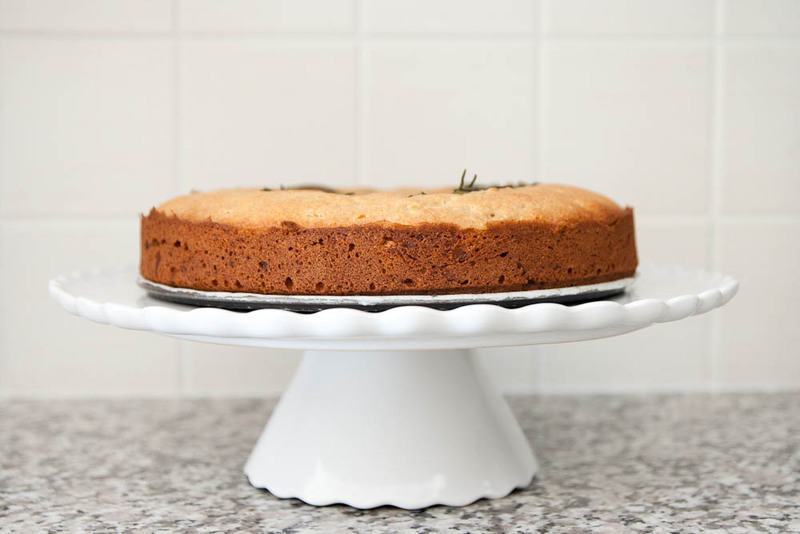 Bake the cake for 30-35 minutes or until a cake tester comes out clean, then leave to cool on a rack. Slip the paper-lined cake out of the tin once it is cool.